Did you know that hostas come in all sizes they range from dwarf to extra large? 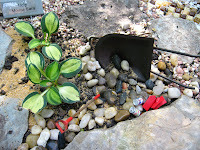 Have you ever seen the cute little mini hostas and wondered how you can showcase them in your garden? 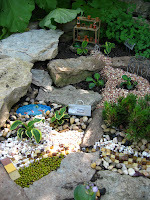 Well one of the ways you can showcase them is to create a miniature garden. To create my mini hosta garden I added a garden bed on to an already existing bed using landscaping stones. I then moved all of my mouse ear and mouse ear sports into that bed. I decorated using miniature items I found in the dollhouse section of Hobby Lobby and ones I bought online through Janit at Two Green Thumbs. I also found small stones in the floral department of Michaels craft store. They are so cute. Im almost convinced to go outside veggie growing and add a Hosta! I don't have any mini hostas, but I will some day. Like how you display yours. You can also create mini gardens in containers if you don't want to use garden space. How small ARE they? I don't see anything to judge scale by. They look adorable, though!